It could've been a perfect day of upsets at the AFC Asian Cup in UAE had Palestine defeated Syria in their opening match of the tournament. Earlier in the day, Jordan beat defending champions Australia and India overcame the Thailand challenge. Palestine didn't suffer a defeat, but neither did they allow Syria, who almost made it to last year's FIFA World Cup in Russia, to win the game. Palestine, captained by Abdelatif Albahdari, put up a brave show and defended resolutely to ensure the match ended at 0-0, securing a crucial point. That determination and spirit of the team has a lot to do with Abdel Nasser Barakat, former head coach of the team. 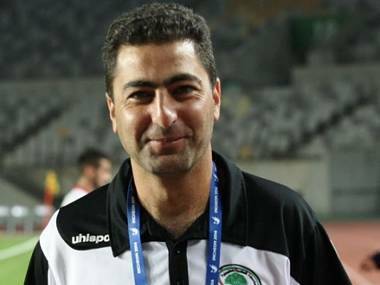 Barakat, who was appointed as the head coach of the Palestine football team in 2015, played a pivotal role in turning the team's fortunes post the side's poor performance at the 2015 Asian Cup – their first appearance in the quadrennial tournament. Under Barakat, Palestine made rapid progress, rising to 73rd spot in FIFA rankings and qualifying for the 2019 AFC Asian Cup. "Barakat played a big role in the revitalisation of the national team. Before taking the (head coach) post, he was in charge of the Olympic team and had done well leading his players out of the group stage of the 2018 Asian Games for the first time. As national team coach, he knew a lot about the generation of players born between 1991 and 1994 and those would go on to form the spine of this current team replacing the previous generation," Bassil Mikdadi, who runs the popular Football Palestine blog, said to Firstpost. Barakat was an attacking midfielder for Al-Bireh in the West Bank. He had quit his footballing career at the age of 25 to focus on his coaching career. Since then, he has been involved in coaching at all age levels, including for his club Al-Bireh and Palestine national teams. He's widely respected among Palestinians for his footballing acumen and he's dedicated at his job. Just when Palestine fans were relishing their team's form and were upbeat about prospects at the Asian Cup, things took a turn for the worse. Turki Al-Sheikh is the member for Saudi Arabia royal family, chairman of the General Sports Authority in his country and also the chairman of the Islamic Solidarity Sports Federation. According to reports, right after Palestine qualified for the Asian Cup, Sheikh struck a deal with Palestinian Football Association (PFA) to appoint Julio Baldivieso, former Bolivia national player, as the new head coach of the team. Barakat was gone and he took up an administrative position with the PFA. The reason was simple; Sheikh offered $1 million for the development of football in Palestine and he wanted Baldivieso, supposedly close to Sheikh and his family from his days of playing for Saudi club Al-Nassr, to take charge for the Palestine football team. Sheikh is an influential figure when it comes to sports and football in West Asia. PFA president Jibril Rajoub, when offered with the aid money, had no choice but accept Sheikh's deal. "It's important to note that Barakat wasn't sacked. He was moved upstairs by the PFA who took the Saudi FA offer to pay for a foreign manager and his staff," Mikdadi said. The turn of events made Palestine football fans furious as they started putting pressure on PFA to remove Baldivieso. They even started an online campaign about it. Under the Bolivian coach, Palestine played just two games but they were nowhere close to replicating their form under Barakat. With the defeat against Oman in an AFC Asian Cup qualification match, Baldivieso was sacked. Despite the change not working for the Palestine football team, Barakat did not get his old job back. Instead, PFA appointed current head coach Noureddine Ould Ali, who was an assistant to Barakat. In a way, it's understandable why Rajoub took the Saudi deal. In the end, money is what matters when it comes to running and developing the local leagues. The fact that local coaches like Barakat were successful in nurturing new talents has a lot to do with the success of leagues like the West Bank Premier League and the Gaza Strip Premier League. Earlier, these leagues were infrequent with a lot of interruption due to violence and political turmoil. That is not the case anymore. "The best thing I can say about the local league is that it is exists with uninterrupted play. This wasn't the case between 2000-2008. It has got its fair share of problems but there's now an entire generation of kids who can play at youth level and then graduate to a first team," Mikdadi said. "Now the leagues have to figure out a way to become sustainable and that requires more long term contracts for players with the stated aim of becoming a selling league that funnels players to bigger leagues." The reliance on home grown players have been growing since last few years in Palestine football team. Traditionally, Palestine have always looked for talent from abroad since their readmission in FIFA, first starting with neighbouring countries like Syria, Egypt and Jordan, and then scouting expatriate players from other continents. Even in the the current team, there are players like Alexis Norambuena, Nazmi Albadawi and Yashir Islame, who were born abroad and play in the non-Palestinian leagues. Before the start of the AFC Asian Cup in UAE, Mikdadi was of the opinion that Palestine have a great chance to beat Jordan in the group stages. But as the tournament progressed, Jordan became the first side to qualify for the Round of 16 after superb victories against defending champions Australia and Syria. After Palestine's morale-boosting draw with Syria, they take on Australia with confidence in their side. A positive result and Palestine's chances of making to Round of 16 increases significantly. A place in the knockout round would be a giant stride considering it was only at the last edition the team first made its first appearance in the tournament. It would certainly make a figure like Barakat proud of his efforts.